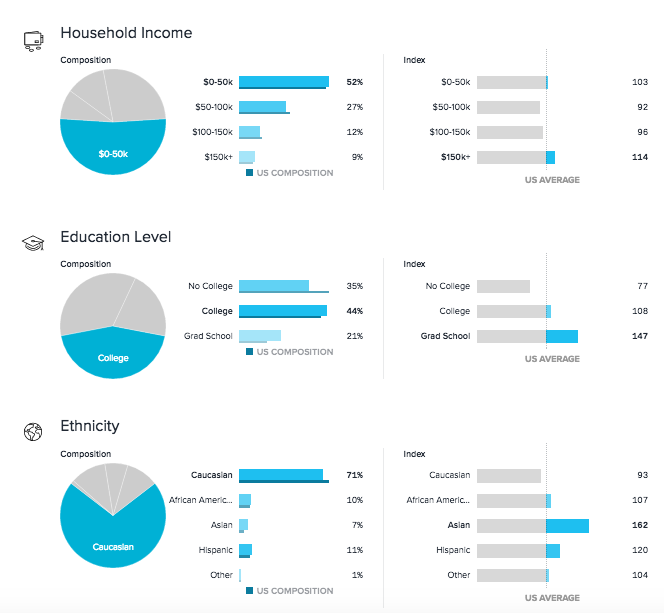 Reach consumers and thought leaders. 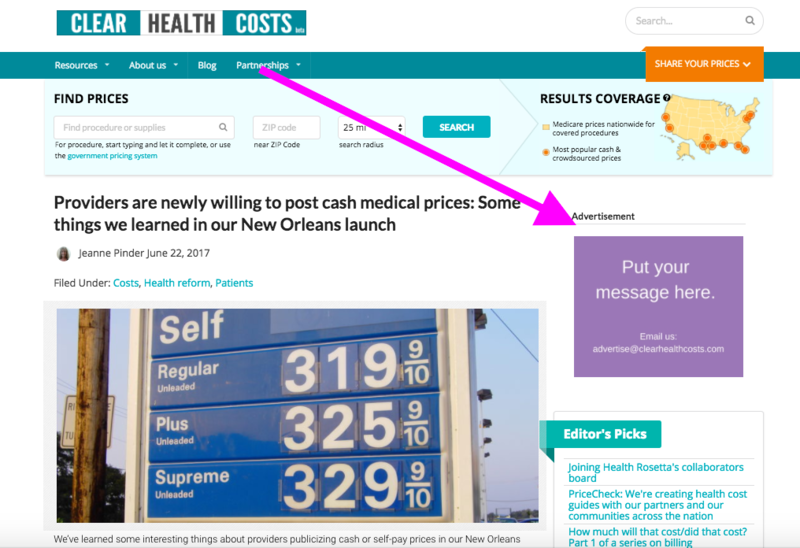 Make your message heard now on ClearHealthCosts.com’s home site, or on our partner sites. 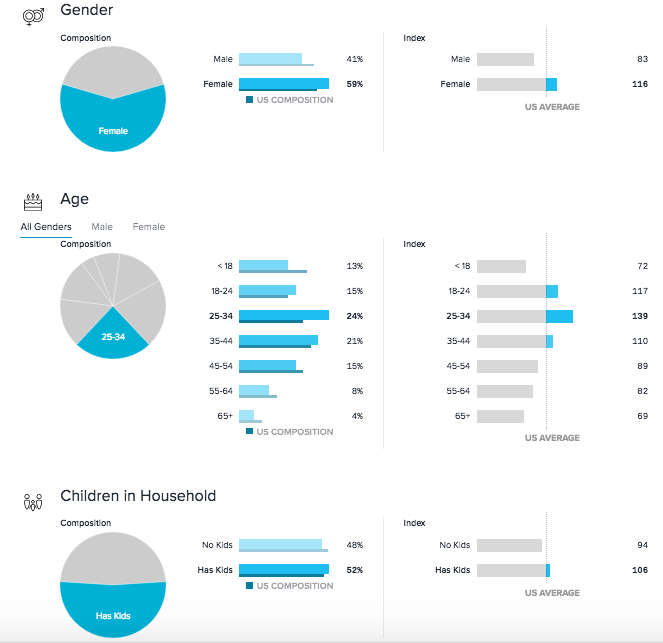 With our groundbreaking price surveys, our partnerships and the consumer information on our blog, we have become a go-to source for health care pricing information. Ask about a sponsorship position with one of our partners on our interactive software nationwide. Here’s the one in Philadelphia, at philly.com. The sponsor tiles are on the right, below the “Search” bar on the interactive software or widget. Other locations are available. Put your message on our home site. 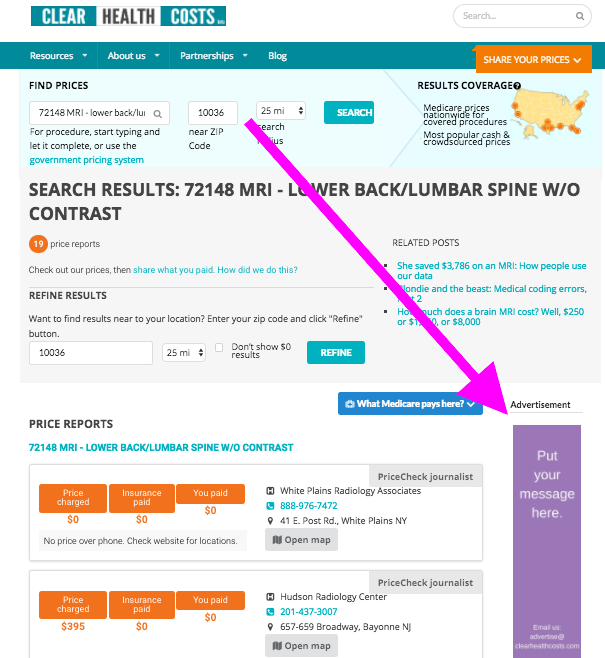 We’re at the top of search results for common queries: How much does an MRI cost? Cost of an IUD? How much does a vasectomy cost? How much does an STD test cost? Our readers are ready to buy. They’re savvy about shopping on the web. More women than men. Educated and affluent. 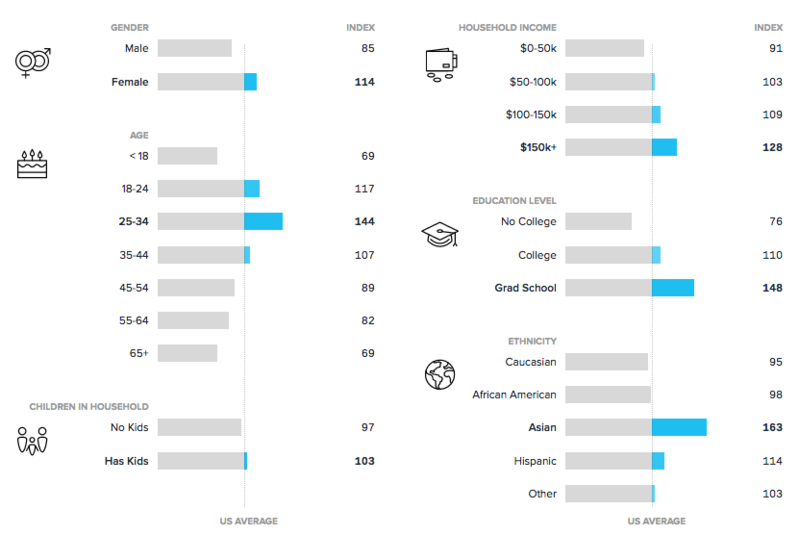 Many are 18-44 (demographics below). We’re experts: We are getting a ton of press attention. The Wall Street Journal, The New York Times and The Los Angeles Times write about us. We were in the Harvard Business Review and JAMA Internal Medicine. We’re on the air with our partners at NOLA.com I The Times-Picayune and WVUE FOX 8 Live television in New Orleans, and WLRN in Miami, WUSF in Tampa Bay and their partnership, Health News Florida. Other partners: KQED public radio in San Francisco; KPCC in Los Angeles; and WHYY in Philadelphia. We’re often seen on national NPR. We’re in USA Today frequently, as well as Parade magazine, the AARP Bulletin and multiple industry publications (The Health Care Blog, MedPage Today, Becker’s Hospital Review). 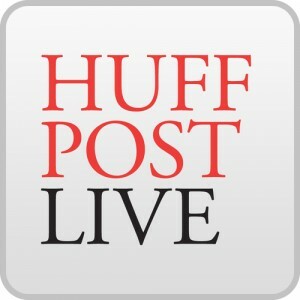 We’re also being seen on new media sites like Reddit, GotAGirlCrush, The Billfold, Business Insider, Lifehacker, TheHealthCareBlog, credit.com, Brokelyn and Jezebel, and praised by thought leaders at Columbia Journalism Review and NiemanLab. Here’s a sampling of our great press. Click on the logos at right to read, or scroll down for more! You can be certain your message will be seen by influencers and thought leaders, as well as by consumers. “Now health care is getting its Kayaks and Trulias.” Tina Rosenberg, The New York Times. “Lowering health care costs: Some benevolent geniuses are on it.” Ester Bloom, The Billfold. Search results page: Right sidebar/Skyscraper (160 x 600px) — $2,000/mo. Blog page: Right sidebar (300 x 250px) — $2,000/mo. Packages available. For additional information or to check availability, please contact: advertise@clearhealthcosts.com. We reserve the right to accept or decline any advertisement or sponsorship offered to us. We will decline to accept advertising that we know or believe to be misleading, inaccurate, fraudulent or illegal, or that fails to comply, in our sole discretion, with our standards of decency, taste or dignity. ClearHealthCosts, like all quality publishers of original journalism, maintains a clear separation between news and advertising content. Any advertising that attempts to blur this distinction in a manner that, in our sole judgment, confuses readers will be rejected.